This is a good furnished apartment in a silent area. The apartment is on the ground floor with an extra entry. Four persons can sleep here. There’s a sleeping room, a large parlour-kitchen, a shower with toilet, a ventilator with a wardrobe and a roofed terrace. Bedclothes, towels and end cleaning are inclusive. We stayed here for one week. The apartment is on the ground floor, part of a big house, with enough privacy, in a beautiful garden. Despite the temperature (~30 Celcius) it was quite cool. Is't small but sufficient for two persons. The S-Bahn was only 10 minutes away en goes to Munich every 20 minutes, but also in the direction of the Stanberger See and Garmisch-Partenkirchen (Zugspitze, the highest mountain in Germany). We recently stayed at the apartment for three nights for a trip to Oktoberfest. We originally had only three in our party but had one more person join us. It was a little tight for four but for two or three it would be perfect. Beautiful setting! It is a a small apartment off the side of the owner's house. Very quiet, residential area. Pretty quiet in the evening. Kitchen was well equipped. A few things that would be a nice addition would be a mirror in the bedroom and hallway-right now only one in bathroom. Also wifi would be really helpful!! We were missing that a bit to tie up some ends for the rest of our trip. Overall a great trip! The owner Katharina was very quick in returning emails and was very easy to work with on reservation! My husband and I spent 7 wonderful days in the Munich area. We were very happy with this apartment. It is close to the train station, a bakery, three grocery stores and one can walk to each. The apartment is clean and well appointed. It is in a vey quiet area and even with the windows open we had excellent nights of sleep. We would recommend this to anyone who likes to stay away from the city but within easy access. We have very nice 10 nights of stay at this place with a 10 months old baby full of comfort and relaxation. A very nice district, quiet and peaceful. Not far from downtown same time. We had a car but metro station is within 10 minutes walk. Thank you Katharina for your hospitality, help and everything. The community Gräfelfing is in the south-western suburban of Munich in the direction to Starnberg. It has 13 000 inhabitants. Many restaurants and beer gardens invites you the whole year. There are good possibilities to go shopping. The train stations to the Ammersee and the Starnberger See are only a few minutes to go away. 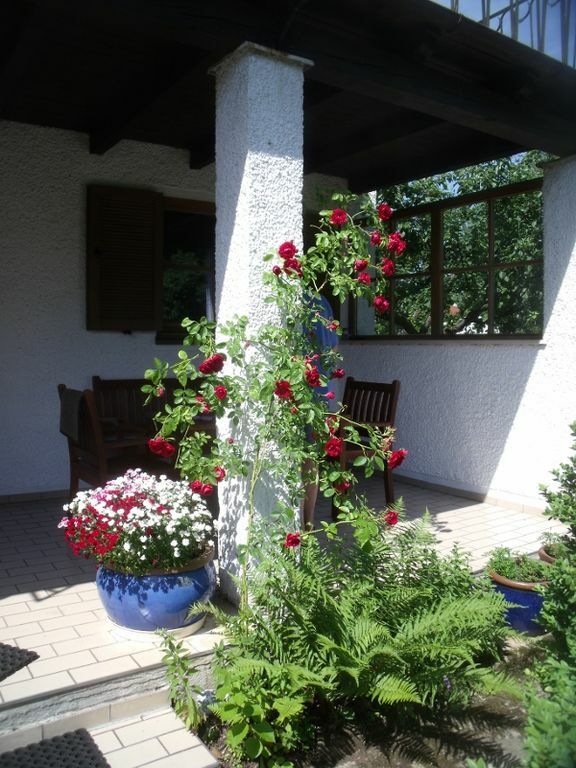 Gräfelfing is close to Munich (15 min to Munich Central Station) and the alps (60km by car). So you have various cultural and sporting possibilities. Route plan: A96 Lindau, exit 3 Gräfelfing, right over the bridge, again right to S-Bahn Lochham, after the subway right, after the traffic circle 300m right, Leiblstr. 7. A99 West, exit Freiham-Mitte, right to München-Neuaubing, after the Edeka (supermarket) right, 4th street left, Leiblstr. 7.